Serene Grace Boosts the likelihood of added effects appearing. The chance of a move's stat/status effect occuring is double for this Pokemon. Run Away Enables sure getaway from wild Pokémon. This Pokemon can always run from wild battles. ously boring into the ground with its tail. Silver If spotted, it es� capes by burrowing with its tail. It can float just slightly using its wings. reaches it and remains virtually motionless there. 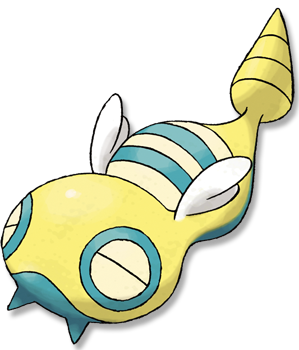 Ruby/Sapphire DUNSPARCE has a drill for its tail. It uses this tail to burrow into the ground backwards. This POK�MON is known to make its nest in complex shapes deep under the ground. Emerald Its drill-tipped tail is used to burrow into the ground backwards. This POK�MON is known to make its nest in complex shapes deep under the ground. FireRed If spotted, it escapes by burrowing with its tail. It can hover just slightly using its wings. Leaf Green When spotted, this POK�MON escapes backward by furiously boring into the ground with its tail. Diamond/Pearl It digs into the ground with its tail and makes a mazelike nest. It can fly just a little. Platinum It digs into the ground with its tail and makes a mazelike nest. It can fly just a little. Heart Gold When spotted, this Pok�mon escapes backward by furiously boring into the ground with its tail. Soul Silver If spotted, it escapes by burrowing with its tail. It can float just slightly using its wings. Black It digs into the ground with its tail and makes a mazelike nest. It can fly just a little. White It digs into the ground with its tail and makes a mazelike nest. It can fly just a little.